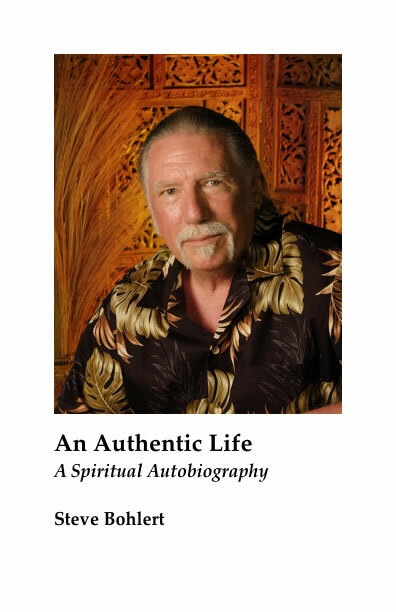 An Authentic Life chronicles the spiritual adventures of Steve Bohlert from his post-WWII New York upbringing to his founding of Universalist Radha-Krishnaism in Hawaii–with lengthy stays in the Bay Area, Europe, India, Fiji, Oregon, and the Midwest. Dedicating his life to the spiritual search from an early age, Steve’s experiences include being a beat, hippie, Hindu monk, New Age leader, Midwest pastor, community organizer, ranch manager, life coach, and spiritual teacher. Steve gives a frank presentation of his life sharing both success and failure so others can benefit from his experience and avoid pitfalls on the spiritual path. Through many transformations–both intentional and by force of circumstance–Steve managed to stay true to his individual spiritual nature. His autobiography encourages seekers to keep seeking in both comfort and adversity, which those who live with personal integrity often face. An Authentic Life reads like a cross between Here I Stand by John Shelby Spong, On the Road by Jack Kerouac, and Siddhartha by Hermann Hesse–all of whom influenced the author. Steve Bohlert is a contemporary spiritual practitioner who chose to follow the road less traveled. Join him on this exciting journey. Steve Bohlert began writing An Authentic Life twenty-seven years ago while memories of his early life were still vivid. Friends found his stories exciting and encouraged him to write them down. He felt people could benefit from insights gained through his experiences. He continued working on it over the years and brought it to a satisfying conclusion this year. It is an epic mythic journey in a contemporary context. Steve Bohlert helped lead the Krishna Movement to its early success (1967-74). Its founder, A.C. Bhaktivedanta Swami, initiated him and named him Subal Das Goswami. Bohlert served as associate editor and business manager of Back to Godhead magazine and started eight temples in North America, India and Fiji. Bohlert lived in India for three years as an itinerant monk. While staying in Vrindaban, he was befriended and mentored by O.B.L. Kapoor, a prominent devotee, doctor of philosophy, retired professor, and author of over thirty books. Kapoor directed him to Lalita Prasad Thakur (1880-1980), who initiated Bohlert into the esoteric practices of natural devotion. In 1978, Bohlert taught at the Whole Life Center in Palo Alto, California. In 1979, he served as State Networker for the New Age Caucus in Los Angeles. In 1988, Bohlert began his studies at San Francisco Theological Seminary and the Graduate Theological Union in Berkeley, California. In 1991, he graduated with a master of divinity degree and was ordained as a pastor and teacher in the United Church of Christ. He served three churches in Iowa, North Dakota, and Michigan until 2002. In 2002, he began an independent eclectic ministry. The Kent-Ionia Labor Council presented Steve Bohlert their 2004 Eleanor Roosevelt Award for his work leading a living wage campaign. Steve Bohlert and his wife moved to Hawaii in 2005. They live an off-grid lifestyle of voluntary simplicity in the jungle on the Big Island, not far from where the lava flows into the ocean. This lush setting provides an ideal environment for his writing and spiritual practices. He is the author of Universalist Radha-Krishnaism: The Way of Natural Devotion; A Practitioner’s Handbook. I started this book in the mid 1980s when friends said my story would make an exciting movie and encouraged me to write it. At the time, I thought I had nothing new philosophically to contribute, but people might benefit from my experiences and avoid some pitfalls on the spiritual path. Since then, I had many more experiences that led me to write Universalist Radha-Krishnaism, which is my unique philosophical interpretation of the Chaitanya devotional tradition. An Authentic Life shows how my perspective developed over the years as my philosophy evolved, and I created a new synthesis of East and West. These two books are really a set that shows how my life and teachings mesh. I thank my wife and friends who read the manuscript over the years correcting my mistakes and encouraging me. I hope you find it a good read. Aloha. This entry was posted on Wednesday, June 6th, 2012 at 10:19 am	and is filed under Our Bookstore and tagged with free ebook, ISKCON, Prabhupad, spiritual autobiography, Steve Bohlert, United Church of Christ. You can follow any responses to this entry through the RSS 2.0 feed.